Who says muffins have to be sweet? These are a great savory accompaniment to eggs or bacon on the breakfast table, and just as good alongside soup, salad, or roasted chicken. 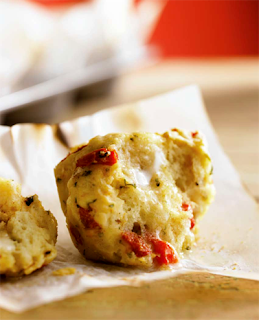 Do not substitute dried basil, because it just doesn’t have the punch of flavor these muffins require. If fresh basil is unavailable, substitute a tablespoon of fresh thyme or a teaspoon of dried thyme instead. 1 Preheat the oven to 375°F and position an oven rack in the center. Lightly coat the muffin tin with melted buter, oil, or high-heat canola-oil spray. Whisk the flour, baking powder, baking soda, and salt in the large mixing bowl. Set aside. In the medium bowl, stir together the feta cheese, roasted bell pepper, and chopped basil. Set aside. 2 Pour the buttermilk into the measuring cup. Add the olive oil and the egg and whisk together until well blended. Make a well in the center of the dry ingredients. Pour the buttermilk mixture into the well and stir gently with a spatula. Mix only until there are no more streaks of flour or pools of liquid and the batter looks fairly smooth. A few small lumps scattered throughout are fine—they will disappear during baking. Gently fold in the feta cheese mixture until evenly distributed in the batter. 3 Use the large ice cream scoop or 2 soup spoons to divide the batter evenly among the prepared muffin cups. Bake for 18 to 20 minutes, until the tops feel firm and a skewer inserted into the centers comes out clean. Transfer the muffin tin to a rack and let cool for 5 minutes. Gently run a thin knife or spatula around each muffin to free it from the pan, lift out the muffins, and transfer them to a rack to finish cooling (careful, these are tender while hot). Serve warm. Storing When completely cool, the muffins can be stored at room temperature, wrapped in plastic or sealed in a resealable plastic bag, for 2 days. Reheat, wrapped in foil, in a 325°F oven for 8 to 10 minutes, until warmed through. The muffins can also be frozen for up to 1 month, wrapped tightly in plastic wrap and then sealed in a resealable plastic freezer bag. Thaw, still wrapped, for 30 minutes before reheating. To use parchment in the muffin pan instead of the traditional pleated paper muffin liners, cut twelve 5 by 5-inch squares of parchment. Fit one into each muffin cup in the pan, pleating the sides slightly where they overlap so they lay flat against the pan walls. The parchment will extend above the top of the muffin cup. Put a spoonful of muffin batter into each liner to anchor it in the pan. Adjust each paper, as necessary so they are centered and even. Finish filling with the muffin batter. Bake as directed. Absolutely nice and yummy muffins! !